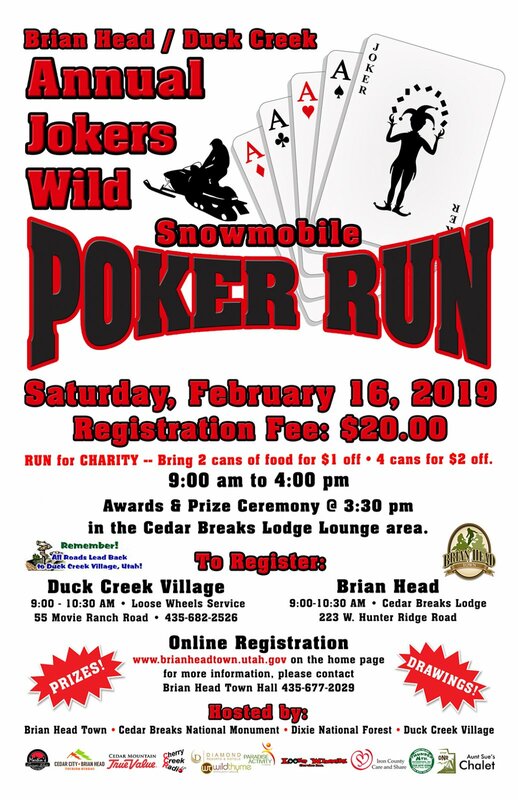 The 10th annual Jokers Wild Snowmobile Poker Run is scheduled for Saturday, February 16, 2019. Registration runs from 9:00 to 10:30 am either at Cedar Breaks Lodge,223 W. Hunter Ridge Road in Brian Head or at Loose Wheels in Duck Creek Village. Registration Fee: $20 p/person - includes a poker card, swag bag and a chance to win prizes. The snowmobile run is a charity event for the Iron County Care & Share. Bring two cans of food and receive $1 off the registration fee, Bring four cans and receive $2 off the registration fee. You can download the registration form HERE or come the day of the event and register. The awards ceremony is scheduled for 3:30 pm at the Cedar Breaks Lodge.